A new chapel and office building were built between the years of 1896-1898. the new chapel holds its first funeral service in 1898. The Story Chapel and Administration Building complex was designed by architect Willard Sears and constructed of Potsdam sandstone in 1896-98. Willard Sears (1837-1920) was chosen as the architect following a design competition for which the architectural firms of Longfellow, Alden and Harlow; Coolidge and Wright; G. Wilton Lewis and Willard Sears submitted proposals. The Trustees of the Cemetery required that the proposed new building, adjacent to the Egyptian Revival Gateway, fit appropriately into the site and not conflict with the existing architecture. Sears described his design as following the “English Perpendicular Style” and as being a more academic version of the English Gothic style than Bigelow Chapel. The historical antecedents of the design clearly made this building a favored addition to the Cemetery. Published reports show that the Chapel (now called Story Chapel) proved to be a welcome choice for memorial services. The exterior of the building maintains its historical integrity although some changes have been made over the decades. The three-story bell tower originally was topped by a short spire that was removed in 1935. In that same year a small addition was added to northwest corner of the Chapel, providing a bathroom and a small room for family use. A porte-cochere at the entrance to Chapel on the west facade was removed in 1971 due to structural weakness and its inability to accommodate large hearses and most automobiles. In July 2012, the Story Chapel Entryway Project was begun to restore the historic integrity of the Chapel’s original porte-cochere. 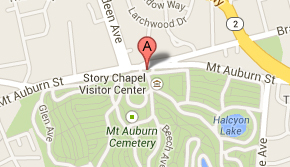 Story Chapel is currently houses Mount Auburn’s Visitors Center and is used for public programs as well as funeral and memorial services.